Rotary Concentrator Systems from The CMM Group, LLC are hybrid VOC abatement systems designed to efficiently remove and destroy volatile organic compound emissions from a process exhaust air stream. The polluted air passes through a rotating wheel where the air pollutants are adsorbed onto a hydrophobic Zeolite media and then removed and destroyed by use of an oxidizer. 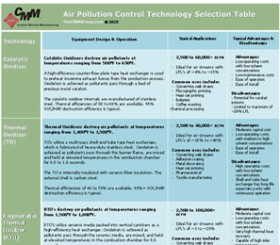 During operation, air pollutants, captured from the process via a ductwork collection system, are passed through a high-efficiency filter as particulate can damage the concentrator wheel media. Once filtered, the polluted air passes through the rotating concentrator wheel where the air pollutants are adsorbed onto the hydrophobic Zeolite media. A slipstream of this air, approximately 10%, is routed through a cooling plenum while the remainder is routed directly to the common exhaust stack. The rotor itself is fabricated from a corrugated mineral fiber substrate to which the manufacturer permanently bonds a proprietary mixture of hydrophobic Zeolite and inorganic materials. The hydrophobic Zeolite rotor concentrator wheel is inorganic and completely inert, has rigidity, physical integrity and the ability to withstand thermal stress. In this application the Zeolite removes the air pollutant from the manufacturing process exhaust air stream as it passes through the rotor. Let us know how The CMM Group can assist you. 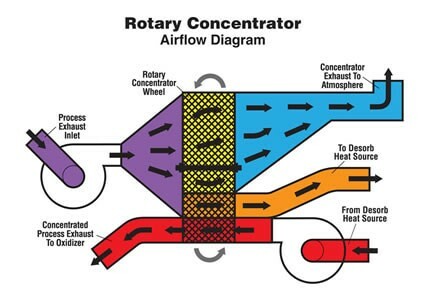 The concentrator wheel rotates at an approximate speed of 2-8 revolutions per hour, continuously passing a sector of the wheel with adsorbed air pollutant through a desorption plenum for removal by a heated air stream; thus continuously returning a regenerated (or clean) sector back into the main housing for further adsorption. Desorption is automated as the slipstream of air that was routed through the cooling plenum is sent through a supplemental desorption heater were it is elevated to desorption temperature of 175°C (350°F) and returned to the concentrator housing. This heated desorption air is directed back through the wheel via the desorption plenum were the concentrated pollutants are removed. 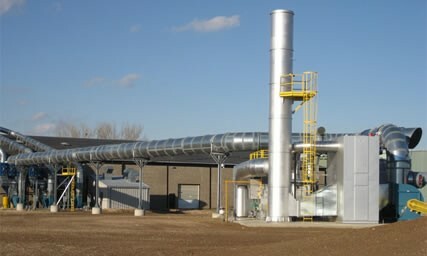 The highly concentrated air stream is then routed to the Regenerative Thermal Oxidizer (RTO) for thermal destruction. Overall air pollutant destruction efficiencies of 96% can typically be guaranteed. We provide turnkey, Single Source Solutions that minimize downtime, maximize productivity, save energy and reduce operating costs. Our professional staff has many years of design, fabrication and sales experience in a wide range of industries from Aerospace Parts to Wood Finishing. We’re committed to providing personalized, expert advice. We offer competitively priced solutions to a variety of equipment needs. We meet specific customer needs through all phases of project implementation while completing jobs on-time and within budget.